Not sure why, but we were both craving pizza like we seem to do a lot on Sunday night. We had already went out for breakfast/lunch earlier in the day and Sunday was a rare day off for both of us. J was wanting to get to bed early and the burger and fries I had for lunch were starting to wear off. 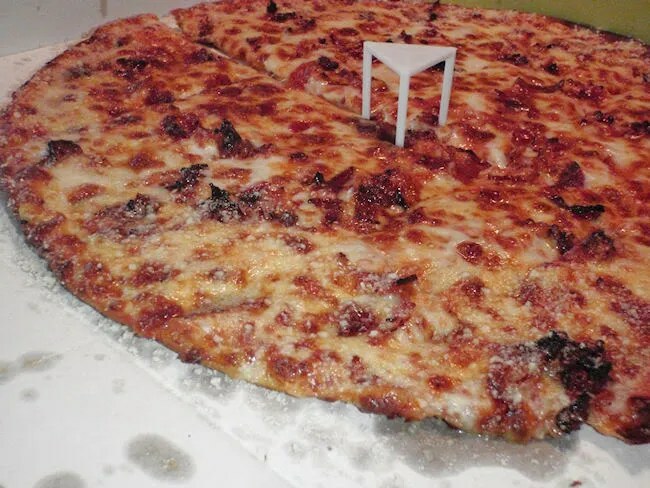 As we sat on the couch watching awful Sunday afternoon TV, I picked up the computer to order a pizza. I was in the mood for something different so decided to point my web browser at Hungry Howie’s. 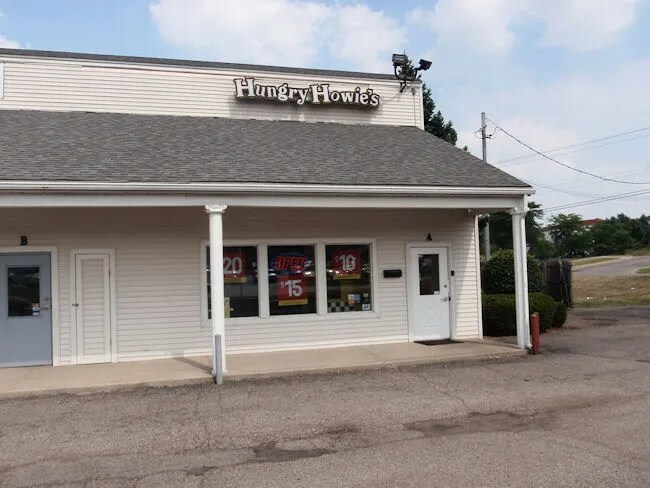 We have never eaten at any of the Kalamazoo area Hungry Howie’s locations, but I did order from the Holt store once when we lived in Lansing. J couldn’t remember if she ate it with me or not, but checking the review shows that she did. There are four Kalamazoo Hungry Howie’s locations and one each in Vicksburg and Decatur. The closest one to us is the Drake Road location which is in a pretty bland strip mall on the corner of Michigan and Drake. I used the online ordering option and while I was doing so, I came across a deal for a large pizza and an order of Howie’ bread for $10. That was exactly what I wanted the price was much better than I could have gotten for something similar at the place we usually order from. The confirmation email said I had twenty minutes until my pizza would be ready, so I hung out with J for ten more minutes before heading to the store. The space serves its purpose and that’s about it. There is a small customer area when you walk through the door. The small pick up counter is tiled in yellow and black which serve as the company colors. There are a couple of plastic chairs along the back wall in case you’re early and walk in to order. I had paid for my order online so all I had to do was pick up the two boxes and head home. The thing I did different this time was to order a thin crust pizza instead of their regular crust like we got last time. The thing I love about online ordering is you actually get the option to order the thin crust. It seems like most delivery pizza joints don’t advertise the fact they do something other than the typical not quite thin, not quick thick crust. I like seeing it right in front of me. Hungry Howie’s is kind of known for their flavored crusts. They were one of the first places I had heard of that did that and they do it for free. We went with the butter cheese. Our topping of choice was bacon. This turned out to be another case where we were really surprised with what we got. The thin crust pizza is much better than the regular crust for us. The crust was very crispy and the top was a nice golden brown. J thought the crust flavoring was a little too salty. I didn’t think so, so we were split on that flavoring. It’s probably not one we would order again unless I was eating it without J. The bacon was plentiful and extra crispy. Instead of traditional triangle slices, the pizza was cut in to wedges. 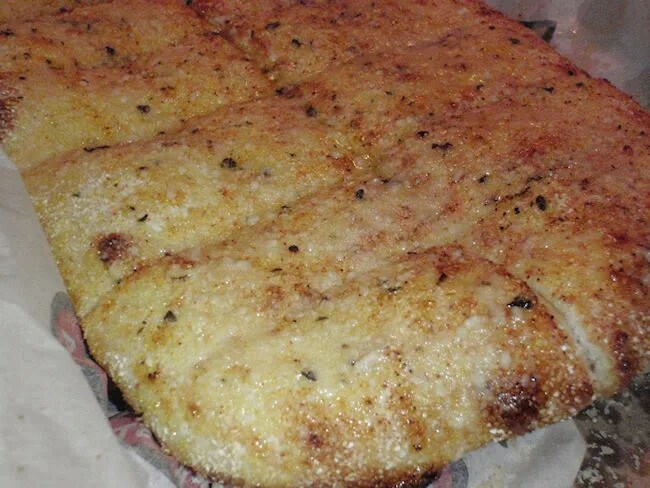 The Howie Sticks are herb-buttered breadsticks with a Parmesan cheese topping. The sticks come with a marinara dipping sauce, but the stupid guy who brought the pizza home somehow dropped the marinara in the back seat of his truck and didn’t find it until the next day. Still, even without the marinara the Howie Sticks were delicious and made for a great snack the next day. 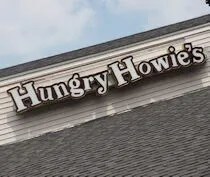 Hungry Howie’s turned out to be a surprise. The price was fantastic. Ten bucks for a large pizza and the Howie Sticks is a really good value. It was a special the day we ordered, but I’m sure they run similar specials all the time. I don’t really remember much about our first visit to Hungry Howie’s three years ago, but this trip will be something we remember.